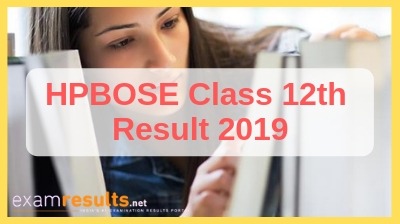 April 19, 2019: The Himachal Pradesh Board of Secondary Education (HPBOSE) usually announces the HP Board 12th Result 2019 as well as the HP Board Class 10 Result during the month of May. The HPBOSE officially conducts the State Open School Plus Two Examination (SOS) Class 12 exams during the month of March. You can check your HP Board 12th Result 2019 on this page. This year, the HP Board Class 12 final exams 2019 have started on 06th March, 2019 and will continue up to 29th March, 2019. The HP Board Class 10 Result 2019 is expected sometime in the month of May, 2019. The official Class 12 exam dates for the academic year 2018-2019 have also been announced by HPBOSE. The exams commence on 07th March, 2019 and will continue up to 20th March, 2019. For regular updates about the HP Board 12th Result 2019, sample papers, HP Board Class 12 time-table keep visiting this website. How to Check HP Class 12 Result 2019? Look for the link which says Himachal Class 12 Results 2019. Level-1 to Level-4 students from tribal areas of Kinnaur, Lahua & Spiti, and Chamba in vocational schools also has been fixed with the consultation of National Skill Development Corporation (NSDC). The State Open School Plus Two Examination (SOS) Class 12 exams 2017 exam began on 06 March, 2018 and ended on 29 March, 2018. The State Open School Plus Two Examination (SOS) Class 12 exams result was announced on 24 April, 2018. Girls outperformed boys in the class 12 board exams, the results for which were declared in April. About 98,281 students appeared for the exams of which only 69.97 per cent passed. Those who did not succeed in clearing the exams had the option of taking the compartment exams or appearing for the papers again next year. The HP Board Class 12 Result can be expected to be announced in the last week of April or the first week of May, 2019. The students awaiting their results are advised to keep visiting this website to get the all latest updates on the Himachal Pradesh Class 12 Examination Results 2019. Given below is the detailed result statistics of HPBOSE class 12 exams for last three years in tabular form. Where to Check HPBOSE Exam Result 2019? You can check your HP Board Plus two results 2019 from www.examresults.net website along with the official Himachal Pradesh Board website- http://hpbose.org/. Bookmark this page (CTRL+D)for future reference. All the best! The Himachal Pradesh Board of School Education is an agency of the Government of Himachal Pradesh. It was founded in the year 1969 as per Himachal Pradesh Act No. 14 of 1968 with its headquarters at Shimla which was later shifted to Dharamshala in January 1983. Its primary function is to prepare academic programmes, prescribe courses of instruction by preparing syllabi for the students and conducting examinations for secondary school students in Himachal Pradesh. HP Board conducts examination for the following classes and courses: 10th, 10+2, J.B.T and T.T.C. As many as 5 Lakh candidates annually appear in the examination conducted by the Board. The board has its jurisdiction from elementary level to senior secondary level and also provides textbooks for all classes from Class 1 to Class 12. In addition to these, the board has set up 26 book distribution/information centres across the state to better equip students by catering to their needs.